For a number of months the Bright Hope World Field Director had been in touch with Lawrence Williams about the situation developing in Papua New Guinea. Lawrence had been on the staff at the Christian Leaders Training Centre in PNG and had been involved in training people to grow rice. This was necessary as rice is a staple part of the diet and the locals are used to eating it. However, recent floods in Oro Province and the huge increases in food prices have made it imperative for local production to increase. In this area the price of rice has doubled and it continues to rise. One of the issues facing the use of locally produced rice is that there are few facilities for processing the rice once it is harvested and dried. Lawrence approached BHW to assist with the funding of some rice mills. There is a need to address rice production at the macro level and this will become part of another partnership opportunity in the future. 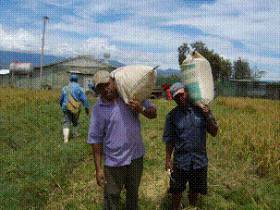 In June 2008 BHW will commence this partnership by putting two rice mills into the Southern Highlands of Papua New Guinea. This is seen by BHW as a pilot and if successful many more of these mills could be installed as the industry develops. Lawrence had introduced us to the SISITI Trust, a newly formed PHG Non Government Organization who will be the ones who facilitate the development of the partnership with the communities in which the rice mills are placed. There are a number of beneficiaries and potential beneficiaries. The churches who initiated this partnership will benefit along with the people who gain employment from operating the mill. 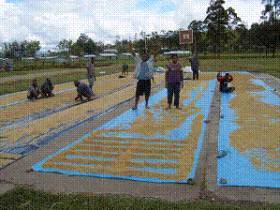 The local community will benefit as their rice can now be processed more efficiently. Having the mill will encourage more people to grow rice and those who do will benefit by having less costs and another income source. It is estimated that around 10,000 people will benefit from each mill. - The fact that this is initiated from the local area. They selected the people to go for training in how to grow rice and develop a small scale industry. 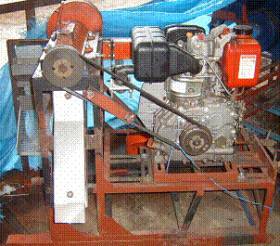 - The leaders are well trained in rice growing and in machinery operation. They are men of high calibre. -There is a strong structure on the ground. There is a good relationship between the local church sponsoring the mill and the local community. The mill will enhance that relationship. 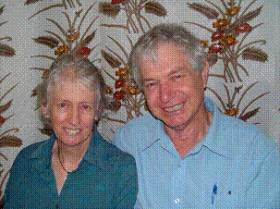 Lawrence with his wife Elaine is a New Zealand missionary and development consultant with service in PNG and elsewhere since 1972. With degrees in agricultural science and divinity, Lawrence taught agriculture at CLTC for 11 years in the 1970s before moving to South East Asia. Returning after some 25 years in various countries, he brought his experience in rice growing as a means of food security for the growing population in PNG. God guided him to establish the Rice Growing Training Programme (RTP) to help meet the needs of the people where some 37% of the people live below the poverty line. In November 2007, eleven trainees including Pastors James Sobe and Yeipa Hamua graduated as foundation RTP graduates and are now serving their communities. Now that the world faces a crisis in food supply, their services are in great demand. Lawrence’s involvement in 18 countries and wide experience in project design, implementation, management and evaluation have prepared him for this challenge of helping to establish a new industry for the people. PNG imports 150,000 tonnes of rice annually and with prices doubling, there is huge opportunity and need now for farmers to grow more rice for the nation’s food security. James Sobe, 55, is a pastor with the Christian Brethren Churches (CBC) in Kelabo, a distant community in the Southern Highlands Province of Papua New Guinea. He has many years of service and is married with 5 children. His people selected him in January 2007 to go to the Christian Leaders Training College (CLTC) Rice Growing Training Programme (RTP) to learn all aspects of rice growing. Since returning home in November 2007, as manager of the Kelabo Rice Growing Project, he has mobilised his people and community to cultivate and plant 1.9 hectares (4¾ acres) of land in rice with no equipment other than spades. This first crop will be ready for harvest in July 2008 and the people are expecting a good harvest. For more than ten years Yeipa Hamua, 48, has served the people of Arou as a pastor in the Koroba – Lake Kopiago District of Southern Highlands Province. After completing his training last year at the CLTC RTP, he has shown the people of Arou how to grow rice on 1.7 hectares (4½ acres) of land that they have cultivated completely by hand. Their harvest is ready for harvest in July 2008. Like Pastor Sobe some 30km away, they now need a small, robust, diesel-powered rice mill to enable them to mill their crop. Each church in the different communities develop their own strategies. The SISITI Trust liaises with them and with BHW to bring about efficient interface between the partners. Each mill will cost around $US2,227. This partnership is for two mills and the total amount is $US4,455. This amount includes: the purchase of the mill and spare parts, two days training for the operators, accommodation and transport costs for the operators and the mill. The mills have to be transported from Lae to their new homes. In November 2007, challenged by the devastating and fatal floods in Oro Province, a small group of people responded by establishing SISITI Trust. Now it has a small office in Port Moresby and is currently being officially registered. Its Board of Trustees and staff are being established along with its operational processes. Its purposes are to provide to the people of PNG a wide range of development services, facilities and training, for emergency relief and disaster rehabilitation, the promotion of small enterprises and other charitable purposes. Grounded in the teachings of Jesus Christ, its vision is to see the people of PNG having a high quality of life, liberty, dignity and freedom of worship, empowered by the delivery of educational, physical, social, and spiritual services. Although it was unable to respond to the Oro floods as it wanted to, its plans for the economic and social rehabilitation of the province remain intact. Confronted by the present global food crisis, it sees the empowerment of the rural poor farmers as the most effective way ahead at present. Some 37% of PNG people, 2,250,000 or more, live below the poverty line, and about 80% of the people, almost 5 million, depend on food-growing for a livelihood. The Trustees have concluded that PNG enjoys all the main requirements for significant rice production as a means of food security and of contributing to the national and international economy. Consequently, assisting farmers and rural people in response to their requests for help to grow more rice is a natural priority for SISITI Trust. This partnership has been funded and the two mills have been installed.